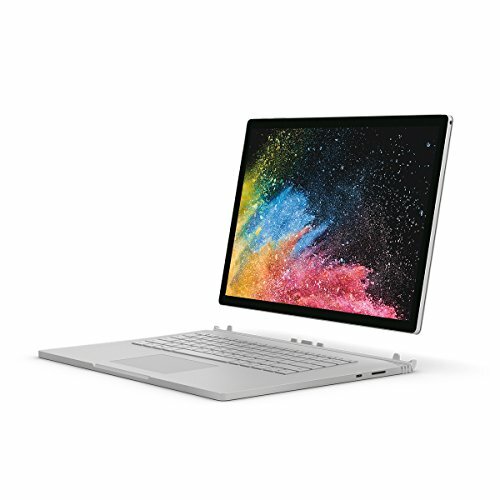 Microsoft Surface Book 2 (13-inch) – It’s singing from the same songbook, but that doesn’t make microsoft’s revised 2-in-1 sound any less sweet. The book 2’s battery life is also admirable, ranging from 7 to 10 hours in our tests – something that’s helped along by that second battery underneath the keyboard. Without that, the runtime’s cut in half which is sitll not bad for a large-screen tablet. MICROSOFT’S ORIGINAL SURFACE Book is going on a couple of years old now, so it was definitely due for a refresh, and that’s basically what you get with this new model. In fact, at a glance, the 2 is nigh-indistinguishable from its predecessor — both 2-in-ls offer a main detachable 13.5-inch (3,000 x 2,000- pixel) tablet alongside a matching keyboard base, which smartly houses a second battery and optional graphics processor, with the latter included to help beef-up the machine’s multimedia-editing chops. And although there’s both new Intel 8th-gen Core i and Nvidia 10 series components inside the chassis, from the outside, the only significant change is a slightly bigger vent behind the keyboard, plus a marginally thicker (and curvier) chassis in this area to accommodate that change. But you’d hardly notice it — the weight’s almost identical (around 1.6kg) and the feel and build quality are, as before, amazingly premium. This is still a bit of a niche device, though — unclocked from the keyboard, the tablet’s large and heavy enough that it’s hard to recommend for casual users, although for professional, stylus-driven design tasks when sat at a desk, it’s undeniably first-rate, with 4,096-level pressure sensitivity making that 13.5-inch screen a lavish digital canvas. The Nvidia GeForce GTX 1050 GPU that’s in the base means the Surface Book 2’s good for a bit of gaming, but what that chip’s really intended for is GPU-accelerated media rendering and encoding — frankly, there are better laptops out there if you want to game. That chip combined with the Core i7-8650U CPU in our review unit did help ramp up encoding speeds, giving you about twice the power of what’s in say, the Acer Switch 5 (see right). The Book 2’s battery life is also admirable, ranging from 7 to 10 hours in our tests — something that’s helped along by that second battery underneath the keyboard. Without that, the runtime’s cut in half — which is still not bad for a large-screen tablet. The entry-level Core i5/256GB model costs a fairly reasonable — minus that Nvidia GPU — with three further models on offer, topping out at the Core i7/1TB model we’ve looked at for this review. Prospective buyers will also want to note that the Book 2s don’t come with a Surface Pen stylus. At time of writing, Microsoft also wouldn’t commit as to whether the 15-inch model of the Book 2 would be sold in Australia. The Surface Book 2 is basically all class, then, although that doesn’t mean there aren’t a few niggling issues, most of which are carried over from the original model. That curved accordion hinge is fairly innocuous-looking when the laptop’s open, for example, but when closed, it doesn’t compress down as well as a traditional hinge design, meaning you’re left with a permanent gap between screen and keyboard, which increases the thickness of the whole unit. Likewise, the tablet is still firmly locked in place until you press a keyboard button to release it — something which requires the unit to be powered up. And if you’re using graphically intensive software at the time, you’ll get a “please resolve before detaching” warning, informing you that you’ll need to close the app or game before the tablet will detach.